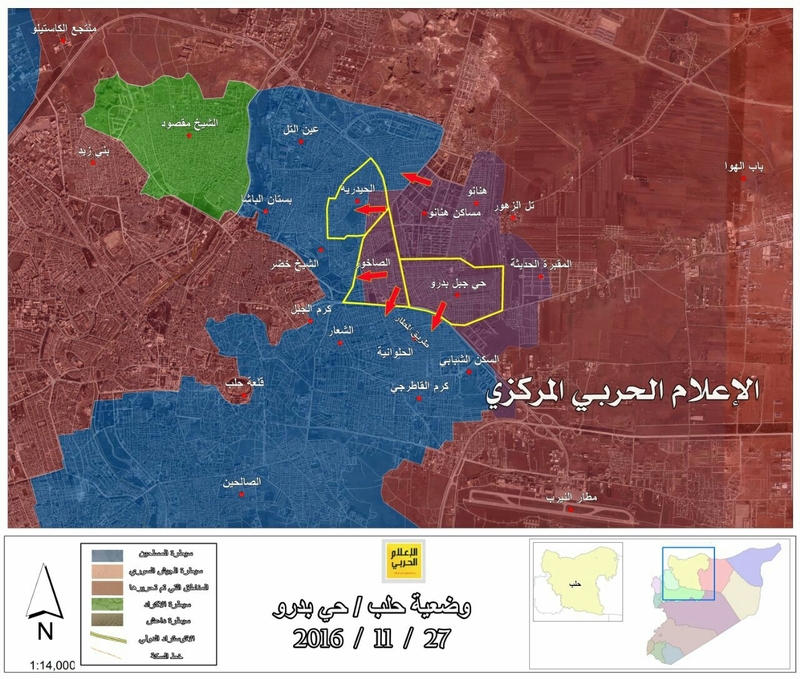 The Syrian army (SAA) and its allies made huge progress in east-Aleppo. There, as seemingly everywhere else, the Jihadi’ fronts are breaking down. Disunity in the opposition, in reflection of disunity among their sponsors, disrupts all of their attempts for new initiatives. The largely hidden Russian air campaign behind the “rebel” frontlines diminished their material and personal reserves. New help for the Syrian alliance will soon come in form of Egyptian forces. With various “rebel” enclaves eliminated by fighting or peace deals more Syrian troops will be freed and become available for new campaigns. Turkey has been told in no uncertain words to pull back from its Syria (and Iraq) plans. With more forces available and under solid Russian (air) protection new SAA initiatives towards Idleb in the north of the country as well as against Raqqa in the east will now become possible. “The revolutionaries are fighting fiercely but the volume of bombardments and the intensity of the battles, the dead and the wounded, and the lack of hospitals, are all playing a role in the collapse of these frontlines,” said an official from Jabha Shamiya, one of the biggest groups fighting against Assad in northern Syria. The destruction of the last hospital for transsexual cats in Aleppo by a thermobaric barrel nuke must have been the tipping point of the fight. This is, I believe, the first time such a ludicrous propaganda excuse has been given for a total defeat. In reality the Syrian forces are avoiding casualties and use their overwhelming firepower to clear the way before their infantry proceeds. This demolishes any defense line the “rebels” can set up even before the real fighting starts. Only hardened and very disciplined troops could hold such a line under fire and offer real resistance. The “rebels” can’t. East of Aleppo city a Turkish move towards Al-Bab was halted by a Syrian airstrike under Russian protection. Erdogan’s plans for a Turkish aligned entity including at least Al-Bab, Raqqa and Manbij went up in smoke. Elijah Magnier gives an excellent overview of the interests behind the various moves in the area and the current events there: On the same day, one year apart, Russia gets its revenge and stops Turkey at the gates of al-Bab. 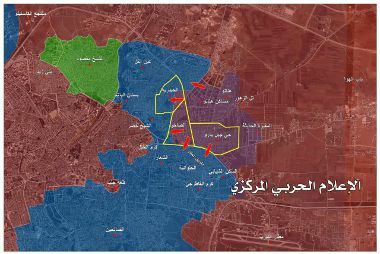 In the south of Syria around Damascus two more small “rebel” enclaves gave up and made peace deals with the government. Fighters who profess to want to die on the battlefield are given a chance to relocate to Idleb where they will later be eliminated (or -more likely – from where they will flee to Europe). Rebels started a new battle in #Quneitra province aiming to break the siege of W. #Ghouta. Pre-emptive shelling ongoing. The Egyptian powers that are, mostly in the armed forces, had kicked the Muslim Brotherhood out of the government. The MB had supported the Jihadists in Syria and Libya and were drifting themselves further into a more radical direction. The Egyptian army move had come after the Saudis had urged for such. They had offered huge amounts of economic help for a new government. The MB were seen as a danger to Riyadh. Then the Saudi priorities changed. The Wahhabis suddenly made up with the political Islam ideologues in the MB. Together with the Muslim Brotherhood ruled Turkey and MB supporter Qatar the new Saudi Arabian rulers reinforced a campaign to implement Islamist rule in Libya, Iraq, Syria and Yemen. This changed the situation for Egypt. Turkey and Qatar became enemies as did their proxy forces in Libya. When the Saudis officially asked the Sisi government in Egypt to support the Muslim Brotherhood the end of the alliance was reached. The MB is THE enemy for Egypt, not ever to be allowed in power again anywhere. It also broke with the U.S. who had supported the MB everywhere. Instead friendly relations with Russia were renewed. 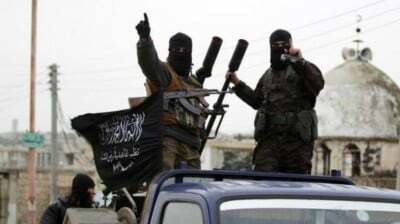 Cairo believes that the installation of any kind of Islamist regime in Syria would endanger Egypt. (Israel could easily transfer Jihadis it actively supports in the Syrian Golan heights to the Sinai peninsula.) It also believes that the current Saudi regime will haven fallen apart due to internal fighting by the end of 2017. It therefore now offers serious help to Syria to fight its enemies down. A few weeks ago a high level Egyptian military delegation came to Syria to discuss their taking part in the campaign under Syrian and Russian command. It is claimed that Egyptian air planes and helicopters relocated to an airport in the Syrian Hama governate. Egypt has a large ground army and open sea access towards Syria. I can and likely will provide serious ground troop elements. France had build two Mistral-class amphibious assault ship for Russia but, as part of sanctions over Ukraine, was not allowed to deliver them to Russia. They were, in the end, sold to Egypt. There they were equipped with Russian helicopters and electronics. It is rumored that they operate with Russian officers on board. Each ship can deliver a full battalion, some 400-900 men and all their equipment, to the beach. With both Egyptian ships doing two rounds each from Suez to Latakia a full infantry brigade with all its ground support elements could be delivered to Syria within days. The Russian helicopters on board of the Mistrals would be the supporting air element. The Russian fleet in the eastern Mediterranean would cover the moves. This would be a fully organized, brigade size military unit able to fight battles on its own in a coherent way. Such a unit is much more valuable that the mostly irregular Shia forces the Iranians hired to help in Syria. Those need logistic and command support from the Syrian army. The Egyptians can, given a task, run on their own. For geopolitical reasons (aka the Suez canal) neither the U.S. nor Turkey would dare to touch them. There are currently some 4,000 Iraqi and some 4,000 Iran hired Shia forces in Syria. 400 Iranian IRCG officers are there to advise and command those. Hizbullah has send some 2,000 of its special forces Ridwan units. Russia has in addition to its air and air defense elements special forces and command elements on the ground. The Egyptian force with some 4,000 soldiers would not be huge addition but it would be a good united fighting element. The political support which such a unit symbolizes is certainly of equal if not more value. France, which feverish supports the Jihadis in Syria, would be completely embarrassed by such a move. The whole world would laugh over its sanction move against Russia when the “Egyptian” Mistrals come in support of the Syrian government under Russian command. If such an Egyptian move happens a Syrian government campaign towards Raqqa is suddenly not only possible but even likely. The Egyptian army has some experience fighting Jihadis in the Sinai. It is not overly shy of taking casualties and it hates the Islamists. It can easily reinforce its own units on the ground with whatever number is needed. If Egypt is serious with this, ISIS in Raqqa is toast and all U.S. plans for a “Salafist principality” in east-Syria and west-Iraq will be in shambles. With all the above and a president Trump likely to pull back support for the Jihadis in Syria the end of the war is coming into sight. Even if Qatar and others continue their support, as it promises, for the Jihadis those will have no chance against the much better organized alliance around the Syrian government. The strongly U.S. influenced European Council for Foreign Affairs just put out a new paper on Syria aimed at EU governments: The First Trump Test – European Policy And The Siege Of Aleppo. A better title would have been: How the EU totally screwed up and lost out with its slavish following of U.S. insanity and its opposition to Assad and Russia. The EU is so disunited and without any foresight and vision that it can not even handle the blackmailing by the wannabe Sultan of Turkey. Blocking all EU credits and support for the Turkish economy would bankrupt Erdogan’s government within months. Putin has shown how to handle the dude. How come no one in in Brussels (or Berlin) has learned from that?